In December 2009, a provincial court judge, Judge A. A. Fradsham, ruled in his 91 page decision, that the City, to any reasonable observer, abused their power over Street Church Ministries, and its lead pastor Artur Pawlowski. He also ruled that certain municipal and provincial laws were of "no force or effect" due to the fact that they infringed on Mr. Pawlowski’s charter rights. In response to this decision Calgary City solicitor Paul Tolley retorted that the City believes Judge Fradsham, in his provincial court judgement, released earlier in December, had "both errors in fact and errors in law." Following this statement the City applied for and were granted an appeal, after missing the appeal deadline. "We are disappointed with the legal department of the City of Calgary, they are not just pointedly stating that they should be able to trample on the rights of Calgary’s citizens, but they have also implied that Judge Fradsham, generally considered a very thorough and competent judge, is in fact unaware of the law and negligent in his duties. That’s a very bold and disrespectful statement for a lawyer to make," commented Mr. Pawlowski. Counsel for Street Church, Michael Bates, notes that the second Constitutional trial will look somewhat different from the first, "The proceedings have changed somewhat following Judge Fradsham’s December 7, 2009 ruling in the case against Art Pawlowski. Following that ruling, the Province of Alberta decided not to appeal but instead to accept the Court’s findings. The Provincial Crown has also withdrawn its charges that were scheduled for trial on March 8, 2010. 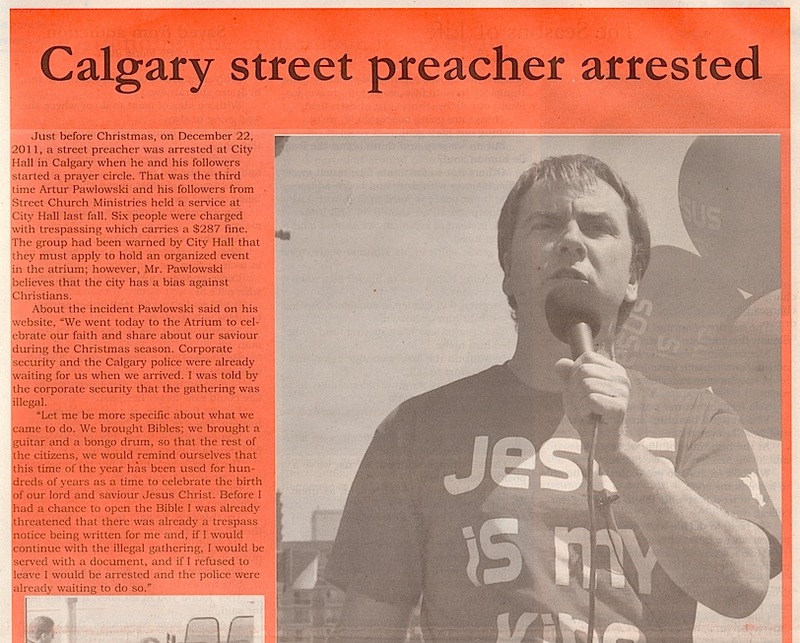 The City of Calgary is now alone in its prosecution of the Street Church. In addition to charges under one of the same provisions ruled unconstitutional by Judge Fradsham (using an amplification system in a park), Street Church also faces charges for providing people with free food in a park and for attracting a crowd by giving away free food in a park, as well as a number of other offences that were not part of the first trial." "We are grateful to the province for seeing reason in this matter. We hope that the province will take the same approach in similar situations in the future, recognizing that we are not wishing to break the law, but rather that we are committed to exercising our Charter protected freedoms, even if it means having to challenge unconstitutional bylaws in the process. 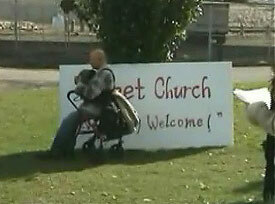 We also wish that the City would follow the Province’s example," stated Artur Pawlowski of Street Church Ministries. Calgary’s City Administrators have attempted other freedom suppressing tactics in the recent past by attempting to bring a new bylaw before City Council that would effectively squash the right to protest at Calgary’s City hall with the threat of being fined with up to 42 different infractions under the proposed bylaw. Fortunately, the Community & Protective Services Committee, headed up by Alderman Rick McIver, had more common sense than the law department and sent the crew packing, telling them not to bother bringing such a law before the committee again. "We find it absurd that the City administrators continue to use these kinds of tactics, in view of the fact that they received a clear message from Judge Fradsham that they needed to be mindful of the rights of Calgarians in the formation and application of bylaws, and that they need to ensure that they do not abuse their power over its’ citizens," said Mr. Pawlowski. On March 8, the City is hauling Street Church before another judge, this time on charges of "illegally gathering a crowd", and on "giving away free goods and services". Street Church Ministries has invited the media and all Calgary citizens, focused on preserving freedom for all, to attend the upcoming trial which will be held at the Calgary Courthouse. Street Church will be holding a prayer and song meeting at 8:45 am on the steps outside the courts. All are welcome to come and participate. For more information contact Artur Pawlowski of Street Church Ministries 403-607-4434.